Marie Pauline Garon was born in Montreal, Quebec, Canada September 8, 1900. Raised speaking French, she was about 10 years old before she learned English. When she was approximately 20 years old, she decided to go to New York where she did find work on Broadway. After a brief stay in New York, she came to Hollywood where she first appeared in a minor role in the George Walsh feature "A Manhattan Knight" (1920) for Fox Films. She had a more significant role in here second film, "The Power Within (1921) for the low budget Achievement Films, Inc. She appeared in nine more films over the next two years, including an uncredited part in Cecil B. DeMille's "Manslaughter" (1922). 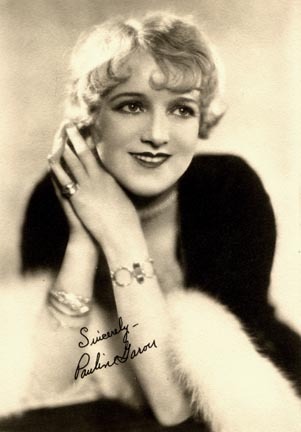 She was, however, hailed as a new Cecil B. DeMille discovery when she was given one of the main roles in "Adam's Rib" (1923), and she was also chosen as a WAMPAS Baby Star that year. However, nothing more came of her association with DeMille although she continued working steadily, although generally in low budget films. For example, she is the star of "The Average Woman" (1924) -- a cute film that survives today and was directed by Christy Cabanne; however it was made by C.C. Burr Productions, Inc., the same company that produced the Johnny Hines comedies. She would occasionally, though, appear in an "A" picture in support of major stars, such as Gloria Swanson's "The Love of Sunya" (1927). Never a major star, she was used in the late twenties by Paramount in French versions of their films. She made over 30 sound shorts and features; however, these were supporting and/or uncredited roles. She has an uncredited part in "How Green Was My Valley" (1941) and then appeared one more time in "Bunco Squad," a minor film with Robert Sterling in 1920. She was married to Lowell Sherman in 1926 but separated one year later. Another marriage to a minor actor, Clyde Harland John Alban in 1940 lasted only two years. A third marriage shortly after to comedian Ross Forester lasted until her death in 1965.